Insurance can be a confusing business. Policy language can make little or no sense, especially when you’ve got jobs piling up, subcontractors to deal with and project owners to appease. What is all this “aggregate” business on Commercial General Liability Insurance policies and certificates? Which ones should be checked on your insurance certificate? Which one should your subs be checking? Does it really matter? The first thing we need to define is what is an aggregate? A policy has several limits including Each Occurrence and General Aggregate. The General Aggregate limit is often referred to as the policy limit. This is the most that the policy will pay out on all claims over the life of the policy. The first checkbox on the certificate indicates that the General Aggregate Limit Applies per POLICY. What does that mean? In the picture above the GENERAL AGGREGATE limit is $2,000,000. 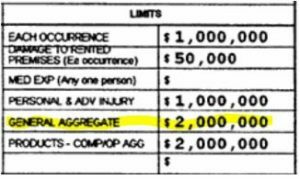 The top limit is an Each Occurrence Limit of $1,000,000. So in any one occurrence, the policy will pay out $1,000,000. The General Aggregate or policy limit is $2,000,000. There can be any number of claims on a policy, but the policy limit will be $2,000,000. Once that is exhausted there will be no more claims paid. If the POLICY box is checked on the certificate, that means the policy aggregate limit is $2,000,000. What does that mean to you? It means that if you have a claim against this policy, the dollar value of all claims against the policy will be limited by the amount of the general aggregate limit left after the claims have been settled (subject to the $1,000,000 per occurrence limit). If there are many claims against the policy that erode the general aggregate limit, you may not receive the full claim payment. The second checkbox on the certificate indicates that the General Aggregate Limit Applies per PROJECT. What does that mean? If you are a contractor, it is likely that you work on more than one project in a calendar year, and so do your subcontractors. A per project aggregate means that the $2,000,000 aggregate illustrated above would apply to each individual project. If you do 10 projects per year then your actual policy aggregate would be $20,000,000. However, the policy limit per project would be $2,000,000. This would also apply if any of your subs have a per policy aggregate. This is highly desirable coverage for general contractors and project owners. They would prefer that your coverage not be eroded by claims on other projects. It is important to note that just checking this box on the certificate does NOT provide per project aggregate. The insurance policy in question must be endorsed to show that the aggregate is per project. This, of course, comes at an additional premium charge. Remember: checking the box does not extend coverage. The coverage must be on the policy for the certificate to be valid. The third checkbox on the certificate indicates that the General Aggregate Limit Applies per LOCATION. What does that mean? If your policy has a per-location aggregate endorsement, then the policy limit applies per location. This would seem to be a great thing for those contractors who have projects with multiple locations – per location and per project? Double coverage! STOP RIGHT THERE. 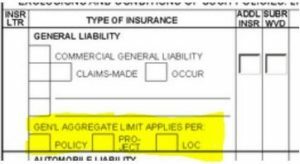 Per location aggregate limits actually applies only to those locations owned or rented by the named insured/policyholder and will always exclude worksite project locations. This coverage would extend to the main office, satellite offices, retail locations, etc. However, the same caveat applies here. Checking the box does not extend the coverage to other locations. The per-location aggregate endorsement must be on the policy for coverage to exist. As always, your Hayes Broker is here to help you navigate the complicated world of insurance policies. Call today for a risk management analysis or policy review.